Macbeth is arguably one of Shakespeare’s greatest plays with themes of the supernatural, fate, and the corrosive nature of ambition. 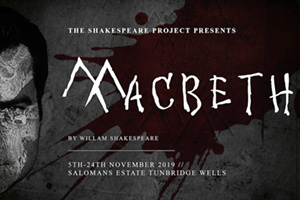 Based on true events, we follow the descent of Macbeth from war hero to murderous tyrant. This production will be performed in the intimate Victorian theatre inside Salomons Estate. The project’s cast and creatives have worked at such prestigious institutions as The Royal Shakespeare Company, London’s Globe and The National Theatre.